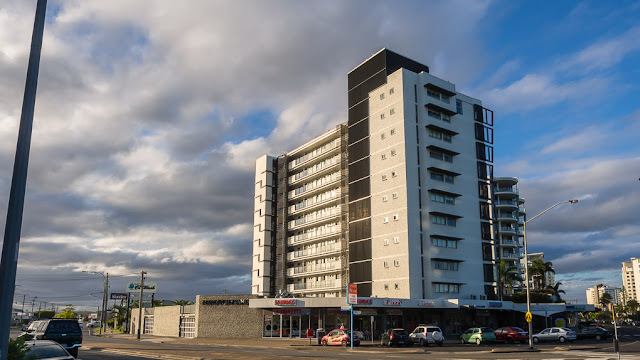 The building from yesterday's post, Maroochy Sands, has undergone a clever "modernisation", but it's a bit hard to hide the fact that it's on the intersection of two multi-lane arterial roads with not much in the way of green surrounding it. If it wasn't just across the road from the beach and not far at all from shops, bowls and library, it may not have any redeeming features! And I suppose I should have photoshopped the light pole out of the picture as well, speaking of having no redeeming features! Across the road from the beach helps!